Escape-Central - Escape Outfitter Skidplates: MORE THAN A DREAM? Escape-Central > ESCAPE TRIBUTE FORUMS > General Chat > Escape Outfitter Skidplates: MORE THAN A DREAM? Posts: 341 Escape Outfitter Skidplates: MORE THAN A DREAM? Anyone interested, here is a pic of the skid plates from the Maverick that I ordered. Pics came from the UK Ford accessories site. 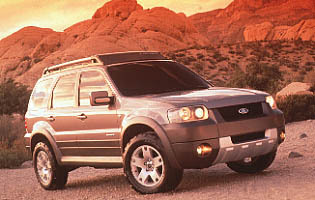 In Britain, the Ford Escape is sold as the "Ford Maverick" and it is now available over there with skidplates. Our club member sixpin found a Euro Ford site that sells Escape Skidplates that look similar to the original prototype Escape Sport model (the one that came with the Outfitters roof rack AND the hot looking skid plates. If there is any member of our board here who may live in England and have a Maverick or who may have more information about the Maverick accessories, we're wondering if these plates will fit on the American version of the Escape? Would anyone else here be interested in these if they are available? I would LOVE to get those skidplates. I have seen Maverick's driving around Dearborn, and it looked identical to my Escape. It was a cursory inspection, but bumper looked identical to the US Escape, so hopefully they would fit. It is the Ford site for England. You can build your "Maverick" and see the price in pounds. I was trying to see some pics of the skid plates but haven't run across them on the site yet or seen the option for them. The pics look just like our Escapes. I want them too!!! Let me know when someone orders them, and how much they paid and if they fit! We need to find out where we can get these in North America, and if they will fit!!!!!!!! I would be very interested in these skid plates. I wouldn't mind the clear turn signals either. I have purchased these skidplates, and yes they do fit. They look exactly like the one's shown on the pic that Greyboy has attached. Only difference is my rear skidplate has a cutout for the trailer hitch. You can get either style. My main reason for getting them is to break up that huge mold in color grey bumper look with a different color and the skid plates do a fabulous job!! Other than the high shipping cost (I think it was $150.. yikes!!) it was a very pleasant and easy transaction. If you search the site for my posts, I give a price breakdown on how much it cost me!! Now, all I need is my Escape XLT Sport!! Delivery date of March 6th!! A couple of questions before I send off an email to order the skid plates. First, what would you say the actual color of the skid plates are? Do you have the product numbers, especially for the rear plate, since there are two versions. I, too have the hitch. Lastly, what does the install look like? I plan on mounting a front grille guard also, and would like to know if the skid plate uses the front tie-down brackets as a mounting point. Several of the front grille guards use them. And does the rear attach using the hitch bolts as a mounting point? I have a WAAG rear bumper guard installed that uses those bolt locations. I have a Westin Safari Bar I too would like to know if it uses the two brackets on the front. So, what exactly are these skid plaes made of? Aluminum, plastic, other? Are they mostly cosmetic, or do they actually protect something? Also, can you give us details on how they mount, and any mods required? Can you give us the part numbers, maybe we can find a US dealer who can order them. Also, where in Michigan are you? I'm in Ann Arbor. I'd love to see these things in person! Othes who are interested in ordering: Maybe we can get some sort of group order discount going. At the least, maybe we can spread that high shipping around by making a batch order that gets sent to the US, and then we ship them to everyone who ordered. How many people would be interested in this? The color of the skid plates are silver. They are made out of ABS plastic (at the most, 3mm thick). They are definitely just cosmetic. The instructions that came with the part also came with paint instructions, so I assume that you can paint them to any color if required. The color is exactly what is shown on the picture that Greyboy has attached in his post. In terms of installation, it is a matter of drilling a few 15.5mm hole into the bumper fascias. In the front, there are 6 holes, in the back, 4 holes. It seems pretty simple. Just put the skid plate in position and mark the places you need to drill the holes, take the skid plate off, and drill the holes. Put a small rubber grommet that has a steel nut inside it ins place in the hole and then put the skid plate back on and put a bolt through the hole and into nut. I'm assuming the rubber grommet then expands, allowing the bolt to retain the skidplate in position. If you look carefully at the pic that Greyboy has attached, you can see the bolt heads. I'm pretty sure that having the skidplates would not interfere with the bumper guards if those guards are using the tie downs. Now keep in mind, I haven't actually done this installation yet. I've just put the skid plates in position on my friend's Escape and it fit perfectly, following the bumper contours and everything. Stayed somewhat snug on the bumper as well without any fasteners. In terms of part numbers, I'll have to check the instructions that came along with them. The e-invoice I just dug up just says "Maverick skidplates". I'll get back with those numbers. As soon as I get the truck, and on a relatively warmer day than today, I'll install the skidplates and post some pics. Thanks for offering to post some pics for me Mikepro, but I think I'll keep using my friends business site until she runs out of space (I don't think she even knows I've got personal pics on that site... hehehehehee...). Also, I'm in the Royal Oak area. I'd have no problem with you coming over to see it. Anything for a fellow Escape Enthusiast. Thanks for the info six, and congrats on your Escape arriving! What colo did you get? Too bad you have to wait a few days to get it though... :j Also too bad you're getting ripped off on the mirror install, but at least you don't have to install it in weather like today. Brrrrrr! If you could find the part numbers that would be really great, maybe we could find someone stateside who can order them. Royal Oak's not that far, I'd definitely make the trip to see these. Email me at mikepro@yahoo.com and maybe we can set something up. P.S. I emailed Chris and enquired about the possibility of placing a group order at a discount, so I'll let you all know what he says.